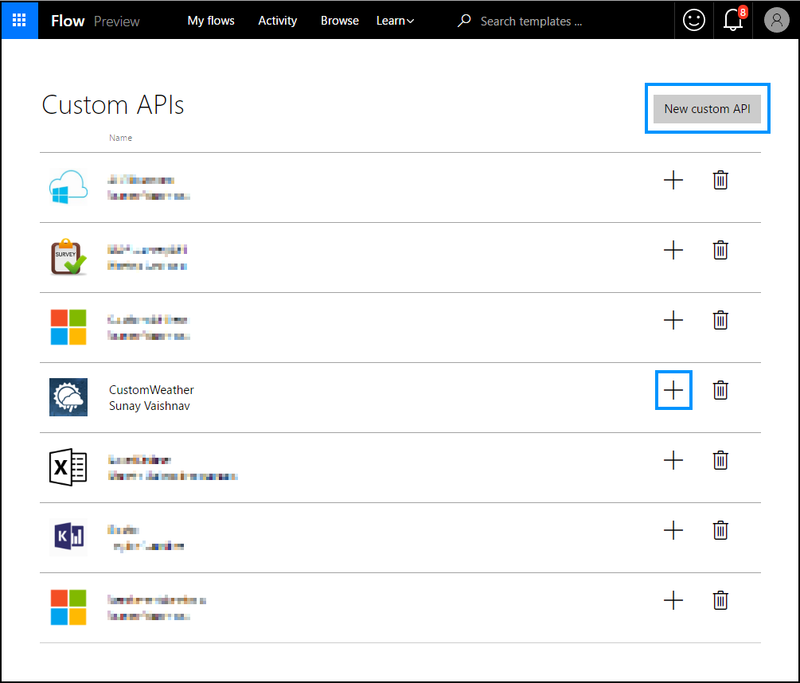 In this blog post, we are going to show you how to create a simple Custom API and use it in your flow. At the end of this walkthrough – you will have some understanding of, how to create a weather custom API and create a flow that sends you weather updates every morning. To start off, you will need to acquire an API key from https://apixu.com, they are nice weather API provider who let you test their APIs for free. You will then need to download the Swagger file that describe the weather APIs. Once you have downloaded and saved your swagger, proceed to upload it to Flow. You can access the custom API create UI from the accounts menu. Click “New custom API” and fill in the necessary details. Upload the Swagger API definition along with an icon to identify the API. Once you have successfully created the custom API, create a connection for it by clicking on the “+” button. You can then setup a flow as shown to send yourself weather updates as push notifications. Be sure to paste in the API key that you acquired in the first place from apixu.